26/02/2009 “Better late than never”. Eyeing a common threat that will govern Israel for the next four years, feuding Palestinian factions have decided to reunify to face Benjamin Netanyahu’s right wing Tsunami that has hit Israeli politics. Rival Palestinian groups agreed on Thursday to form a national unity government by the end of March, faction officials said after reconciliation talks in Cairo. Mohammed al-Hindi, deputy leader of the Palestinian Islamic Jihad, confirmed the factions had agreed to establish the government by the end of next month. A deal between the two factions is seen as key to moving ahead with Gaza’s reconstruction after Israel’s recent offensive. The Palestinians hope to raise $2.8 billion at an international donor’s conference in Egypt on Monday. Hamas and Fatah met in advance of Thursday’s main talks on more challenging issues like holding elections and sharing power. 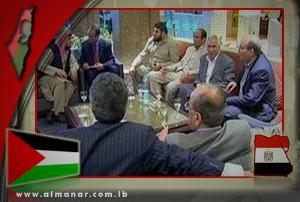 The two sides met in Cairo for talks mediated by Egypt’s intelligence chief, Omar Suleiman. At a news conference Wednesday night, both sides announced they had agreed on a release of detainees. “To encourage a positive atmosphere, there will be a complete and immediate end to the arrests of political prisoners … and the release of prisoners during the discussions,” said Hamas’ senior official, Mahmoud al-Zahar. “There will be a larger number released” later. Zahar said 80 Hamas members held in the occupied West Bank, which is controlled by the Fatah movement, have been released and that 300 are still being held. Hamas has also lifted the house arrest of a number of Fatah members in the Gaza Strip. Speaking earlier in the day, Nabil Shaath, a top Abbas aide, said the sides also agreed to immediately stop all media attacks against each other. Azzam al-Ahmed of Fatah said Thursday’s meeting will discuss the “political shape and agenda” of a future unity government. Fatah was continuing to arrest Hamas members in the West Bank. The reconciliation process was relaunched by Egypt after Israel’s 22-day war on Gaza that ended last month with more than 1,300 Palestinians killed, including 420 children and buildings and infrastructure destroyed. Hamas democratically won over Fatah in the 2006 Palestinian general election but its government was boycotted by Israel and the West, and attempts at forging a national unity government failed. Israeli Prime Minister-designate Binyamin Netanyahu is expected to lobby Secretary of State Hillary Clinton next week against US recognition of a Palestinian unity government that includes Hamas, top advisers to Netanyahu said Wednesday. Shoval said history had shown that when there was an amalgamation between what he called “a moderate and an extremist party, it was only a matter of time before the extremists called the shots.” “The idea is the wrong one,” he said, adding that Netanyahu’s camp believed the right approach was to continue to isolate Hamas. I’m not saying we can prevent it, but we should try,” he said. Hamas’s refusal to accept Israel’s existence, and its resistance activities, were core problems, another Israeli adviser said, and it would be counterproductive to overlook the problems by seeking structural reform. The adviser added that structural reform would not make the core problems disappear. He said that “Israel’s right to self-defense was sacrosanct”, and that it would continue to exercise that right when it felt it needed to. On a visit to Cairo on the eve of the talks, British Foreign Secretary David Miliband called for the Palestinians to form a new government of “technocrats” to oversee reconstruction of the economy and the political process in readiness for elections. Sweden also expressed support for Palestinian reconciliation. Prime Minister Fredrik Reinfeldt said his country, which takes over the rotating EU presidency on July 1, wants to help politically in the process of possibly holding new elections in the Palestinian territories. “Reconciliation between Fatah and Hamas is also a part of the process,” he said in Stockholm after meeting Abbas.